Another mommy's post. Last night my family (including my parents and siblings) went to The Mall after we had our sungkai. So I went to MISSHA to check out their lip gloss. I might be going to write about this soon, Insya Allah. I was asking about their new Super Aqua Cell Renew Snail products then the super nice lady told me that my face does not need this. "Your face is ok", she said. You only need to maintain she continued. I would suggest you to use Time Revolution First Treatment Essence to make your skin firm and moisturise. This lady reads my mind! I am looking for something for my face. 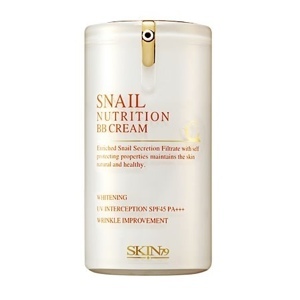 Recently, I tried Skin79 Snail Nutrition BB Cream as recommended by my sister. She is currently using Vital Orange BB cream and BB Cleanser O2 too as she has more blemish than I am. I don't have problem with blemishes actually because it usually clears completely from my face in few weeks. So far, I'm liking this cream on my face. No more dry skin as Dear Husband put it. I really want to try this product except it's not in my budget for this month. 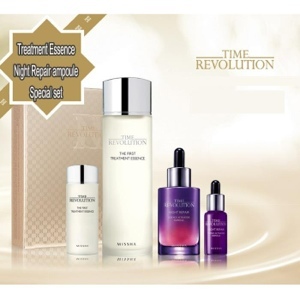 Anyway if you would like to give this a try, they have a special set of Time Revolution First Treatment Essence 150 ml + 30ml and Night Repair 50ml + 10ml cost $185.90. We can also buy individually at $92.90 each. Looking at how little we need to apply to our face twice (morning and night) daily, I think a bottle of First Treatment Essence can last for 3-6 months. It's definitely a bargain right? All this while, I only use cleanser facial wash daily. Before I used Nivea O2 but its so hard to get it so we changed to Hada Labo from Guardian. Btw, Hada Labo cleanses BB cream and make ups as effective as BB cleanser that my sister is using and its quarter the price she paid. I don't know why but lately I care about my skin more than usual. Is it time for me to start using the Essence? Hmm.. So what do you use for your skin care products? Any other products you'd like to recommend? BB cream is Blemish Balm cream. Like Skin79 its moisturizing, improve wrinkles, whitening, etc. More like a base before you put on make up (ie foundation) but this is more beneficial than foundation. And you can wear them without make up too! ;) Youtube ia! Byk tu org punya reviews..
Aku pun karit to spend on these beauty products! Haha.. Yth selalu pakai facial wash saja but since ermm rajin kan jaga skin recently haha.. The good thing about this BB cream, if the bottle above (yg Snail) my sister-in-law cakap can last up to 6 months! Inda lah every month membeli hehe..
btw, since you're still a SAHM atm.. why don't you buat Homemade Baby Food business and sell them online through here or FB. i think for career mommies out there yang care for what their babies makan, this idea will be an option for them to lessen the 'list' of stuff to worry. talked to my sister and she told me NOT to use the cream during nighttime. Bcos mlm our pores open and the cream will block it. hmm.. I need to ask the SA if we can use the essence instead for mlm hehe..
bwoh! handal jua your sister ani. banyak ia tau hehe. i can't remember apa saja I've tried before but I remember this one yg pakai green apple essence for facial wash. kancang and karing kulit ulihnya.